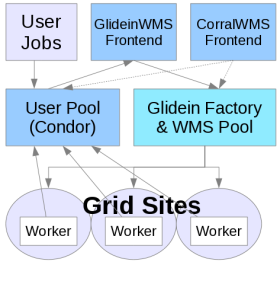 The Glidein Frontend is, as the name suggests, the user interface of a glidein based WMS. The main task of the VO Frontend is to look for user jobs and ask the Glidein Factories to provide glideins, if needed. See the picture below for a general overview. The VO Frontend knows nothing about the glideins or Grid sites; the only information it has are the attributes that the various Glidein Factories publish. This makes the life of the Frontend much easier, as it only has to worry about matching user job requirements to the Factory attributes.